As a newbie to the site, I suspect I'm also the oldest reviewer here. I THINK the first movie I saw was Rear Window during its opening run when I was 4. It scared the pants off me and I had to be led screaming from the theatre after Ray Burr menaces Jimmy Stewart. Never been the same since. More recently I've been a regular poster at the Criterionforum (org version) and an occasional one at a_film_by. I really marvel at the way the Web has opened out serious (and entertaining) film talk from the narrow domains of Academia and the Library. For all of us who love movies. 56 Chapter stops, no chapter Menu option, only selectable with forward/reverse buttons. 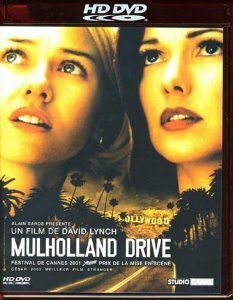 The Film: Originally intended for TV, Mulholland Dr. is much in the mould of Twin Peaks and Lost Highway. Lynch's characteristically bizarre noir focuses (probably too strong a word!) on a young beauty (Harring) who loses her memory after a car accident and hides out in a house where she's found and befriended by the absent owner's helpful niece (Watts), new to LA in the hope of becoming an actress. Meanwhile, a hot young film director (Theroux) is having trouble with the Mob trying to influence his choice of leading lady. Despite too many detours into nonsensical narrative cul-de-sacs, and too many shots that slowly travel towards corners down darkened corridors to the accompaniment of ominous rumbles, this works well enough as unsettlingly nightmarish suspense. That is, until it suddenly and stupidly decides to switch characters' identities, leaving one with a so-what feeling of d�j� vu. The image is entirely unlike any previous HD disc I've watched including The Searchers, Casablanca, Dune, Brokeback, King Kong etc. In place of the amazing sharpness and background detail, this appears to have much more (film-like) grain, and - overall - has a general slight haze (less pronounced in interiors.) The contrast is far more refined and the overall PQ far less "hard" than the SD. While nowhere near apparently "Sharp" as other titles I suspect, but can't confirm it is probably closer to original 35mm screenings. One problem however, which may be the result of my setup (???) is some slight vertical banding. I've never seen this in any other discs - HD or SD before, and Mulholland is my first French HD. But maybe I'm imagining it. After re-viewing the HD back to back with the R1 SD version, what you get in the HD is hairline thin vertical lines every time there is a large mass of white or pale color (like Naomi's yellow sweater) in slow movement. These look not like film wear but like digital artefacts which have possibly been introduced at the transfer to Datacine stage. This, plus the overly soft image (in comparison to the relatively clean and tight SD) rules the Studio Canal HD out as an acceptable transfer, sadly. And there is no reason to believe Optimum's UK HD version is October will use anything but the same source. I do note Optimum released a "new" SD of MD in the UK last year. At least one review comments negatively on the image in that transfer although no mention is made of vertical banding or similar issues. **NOTE**: It has just come to my attention this disc also suffers from the now common Studio Canal "Pitch glitch" problem. In simplest lay terms possible, their datacines, although transferred at film speed of 24 fps were taken from a 25 fps PAL master, consequently the audio has had to undergo a "retread" which gives it the same near semi-tone pitch rise as SD PAL 25fps transfers. Another cross against this release, and the title joins several more Studio Canal HDs with this defect. This is surely an issue they now have to seriously address if they expect to market ahead of any American or other releases of Universal titles. There are NO audio issues, like the PAL speedup nonsense which plagued S-C's HD versions of Total Recall and Basic Instinct. I don't recall the SD R1 DTS track being particularly punchy but unless Studio Canal revved it up or it's in the original, the DTS HD (English, there's also a French DTS HD audio track) is a knockout. The soundtracks are both excellent. Given lossless audio, discrete instrumentation, transients, clarity, tone all faultless. As though to give you a hint Studio Canal had camped up their wonderful Logo at the top, adding literally bells, whistles and bird tweeting!! Wonderful! French subtitles support the audio.